Following the Soto Zen Buddhist principles, the center offers a quiet place to sit in the company of a growing and supportive Buddhist community. All are welcome. 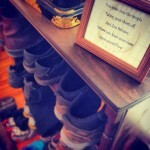 We have weekly meditation times, dharma talks, discussion groups, potlucks and retreats. All are welcome and invited to attend. If you have never practiced Zen, take our introduction class. We will instruct you on the fundamentals of meditation and Zen practice on the third Tuesday of each month from 7:00 to 9:00 p.m. Attendance of the introduction class is free and not required to attend other activities at the center. Questions? Email us – info@dmzencenter.org. 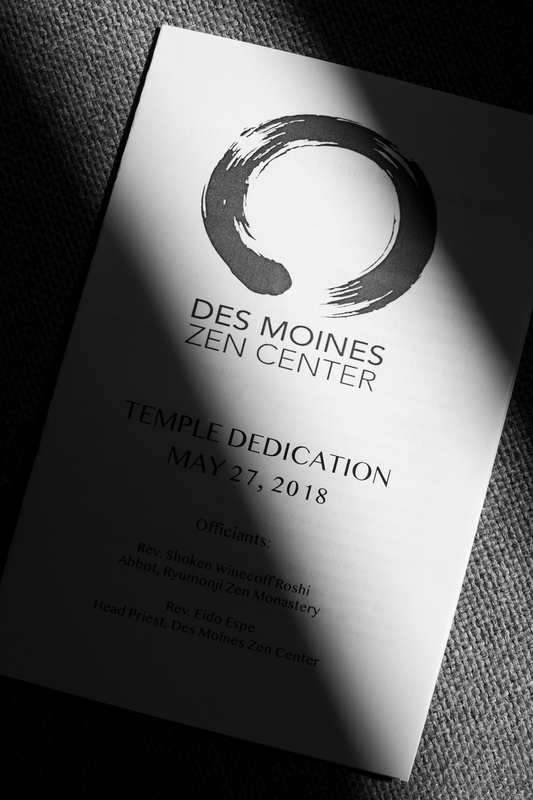 Be sure to check out pictures from the Des Moines Zen Center temple dedication held on May 27, 2018. Shoken Winecoff Roshi, the abbot at Ryumonji Zen Monastery in Dorchester, Iowa offered an invocation at the ceremony. 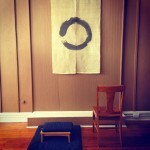 Zazenkai Retreat: Upcoming Des Moines Zen Center zazenkai on Saturday, April 6 from 8 am to 5:30 pm. 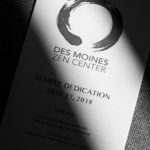 The Des Moines Zen Center will hold a daylong zazenkai on the first Saturday of each quarter (January, April, July, October). View the retreat schedule. Interested people may sign up on the sheet at Zen Center or email info@dmzencenter.org. Book Discussion: Our next book discussion group will read Ecodharma: Buddhist Teachings for the Ecological Crisis by author David Loy. David Loy spoke at the Des Monies Zen Center in November of 2018. If you don’t have a copy, you can obtain a copy of the book on Amazon. As usual, our meetings will be the second and fourth Wednesdays of each month beginning at 7 pm after 6 pm zazen. The next Red Barrel Food Pantry Donation Day at the Des Moines Zen Center is on Sunday, April 7th, 2019. Contributing to the Red Barrel Program, including all non-perishable food and personal care items, goes to the Des Moines Area Religious Council (DMARC) Food Pantry Network. The Red Barrel at the DMZC is located in the lower level.